Well, that’s not entirely fair. Ludvig II of Bavaria did build the crazy 19th-century Disney-before-Disney castle in southern Bavaria, the most photographed tourist attraction in Germany apparently. But “Mad” King Ludwig was actually removed from power on the grounds of mental incapacity even though no medical examination took place. And then he died the very next day, which you have to admit looks pretty suspicious. Geography buffs will have noticed that Bavaria is not in Belgium, so yes, this German beer is a bit off-topic for this blog. But at Monday’s tasting of Chimay Grande Réserve 2005, Michael gave me a bottle of this, so a connection to Belgium exists. And it is beer, so, that’s good enough really. Onward to the pouring... And tasting... This dark brew tastes gorgeously burnt and malty, but it’s not too thick or syrupy. It’s not sweet but has a strong hoppy bitterness. It has good depth, bordering on stout even. You can tell it’s not a Belgian dark ale right away, of course -- no dates, raisins, black cherries, cream, nutmeg, etc. and no high alcohol content either, only 5.1%. But who cares? 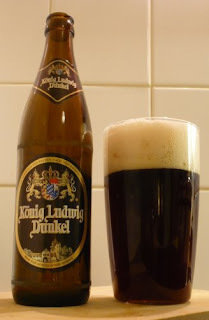 König Ludwig Dunkel is a lovely beer, a serious contribution to my continuing zymurgological studies. You’d be mad to pass one up. Thanks, Michael! And since I should be in Bavaria with a few old drinking partners a bit later this year, I think I’ll be seeing this beer again quite soon. I was there last October. Had Dunkel in the restaurant, a few really.The restaurant used to be the stable for the knights horses. Had a dinner of wild boar roast. Roaring fire in the pit, waitress in Dirndles, lights low, good friends and family and a cold dark beer. Man, I miss it. Can't wait to go back next year.